Congratulations to Karen Walker, winner of my 50,000 hits contest. Though Karen lives across the country, we’ve shared a lot over the past year through the Blog Book Tours group. 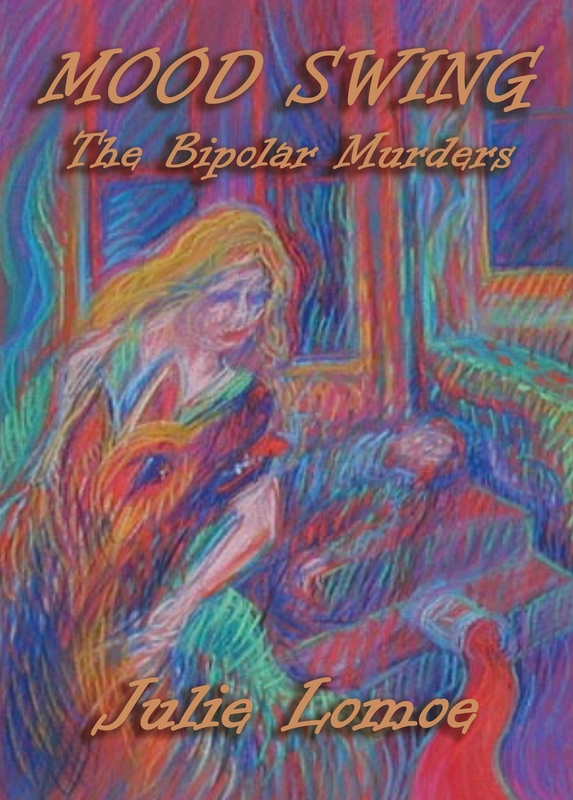 I invite you to visit her wonderful blog, Following the Whispers. Here’s the post I contributed to her blog for my Blog Book Tour last November. 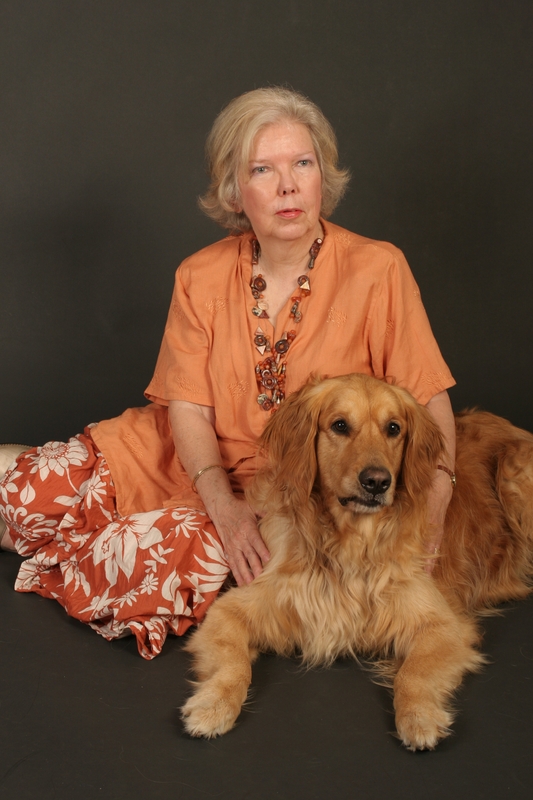 Dogs have long played a central role in my life and my fiction but Lucky, the beautiful golden retriever in my author photo for Mood Swing: The Bipolar Murders, may have been the last dog I’ll ever own. Six months after the photo was taken, he died of lymphoma, and in the years since then, I’ve switched to cats. Setting up this Blog Book Tour, reading my hosts’ reactions to the photo, I realized I’d never written about Lucky. Since Karen’s blog focuses on memoir and nonfiction, this seems like the perfect time. Rishi was halfway out the window and onto the fire escape when I tackled him. Arms around my dog’s massive shoulders, I groped for his choke chain and yanked hard. Half a dozen pigeons flapped skyward, squawking. He’s leaner and rangier than a German shepherd, stockier than a Doberman, bigger than a Rottweiler. Despite his forbidding looks, he’s a basically friendly beast, but sometimes it’s in my best interests not to let people know that. That last sentence was literary license. Rishi was wonderfully affectionate and loving, but only to our immediate family, and he was never adequately trained. Despite a near-death experience with a neighbor’s hammer that left a permanent dent in his skull, Rishi lived nearly ten years, a good long life for a big dog. But his death threw me into a deep depression. Enter Lucky, a year or so later. He came into our lives with what seemed at first to be joyous synchronicity. At a Woodstock party given by friends of my daughter Stacey, someone mentioned having a golden retriever who needed a new home. I was instantly intrigued – we’d owned a beautiful golden named Shawna when Stacey was a child, and except for her propensity to chew up the woodwork during thunderstorms, she’d been a wonderful member of the family. Right after the party, I paid a home visit to meet Lucky, fell instantly in love, called my husband on my cell, and within a week we had a beautiful four-year-old male golden. He came with a tragic back story: he’d been the beloved companion of an 84-year-old man who lived alone in the Catskills, and when the man was hospitalized, one of the nurses befriended both him and Lucky. Shortly after the man’s discharge, he was brutally murdered by a neighbor he’d known and trusted for years, a handyman in search of money for drugs. The nurse took Lucky in, and in turn passed him on to the folks who gave him to us for adoption. The poor dog was threatening the family’s togetherness. They already had a couple of young kids, a poodle and a cat, and a rambunctious young retriever sent them over the top. The husband’s job took him on the road a lot, but when he was home, he told us, he and Lucky slept together downstairs while the wife, kids, poodle and cat slept upstairs. Not exactly a prescription for marital bliss, so Lucky had to go. Soon after the photo session with Lucky, his health began spiraling downward. He couldn’t seem to keep food down, and he was weakening and losing weight. After extensive testing, the vet diagnosed lymphoma. In a futile attempt to buy more time, we opted for extensive – and expensive – surgery. In retrospect, that was a mistake, but he’d been so young, so lovable, that we thought it was worth the gamble. He died in early fall. We buried him in the garden out back, marked the spot with a marble plaque bearing an iris design my husband had carved years before. I planted dozens of bulbs – crocus, daffodil, and hyacinth – and they’ve bloomed luxuriously in the three years since. Dogs play a major role in both my novels, but they never, ever come to a bad end. 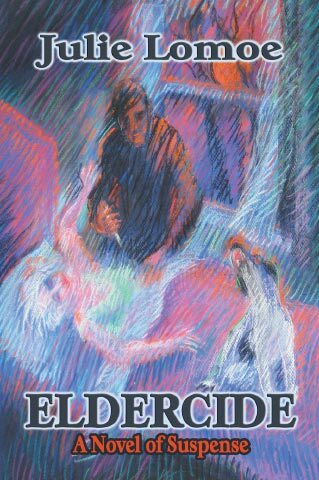 In fact the villain in my suspense novel Eldercide nearly refuses an assignment when he thinks it might mean harming the victim’s Jack Russell terrier. And I could probably never write that scene where the neighbor tries to murder Rishi with a ball peen hammer, with me coming between them, shrieking that he’ll have to kill me first, screaming bloody murder until the neighbors call 911 and the police arrive. On the other hand, maybe enough time has passed – and after all, the dog survived in the end. As I write, my cat Lunesta is writhing around on the desk next to my computer, tempting me to rub her tummy and doing her best to bat the mouse out of my hand and onto the floor. Does she sense I’m writing about dogs? Is she demanding equal time? For now, she’ll have to wait. Post script five months later: it’s a beautiful spring day, and the green shoots of the crocuses, daffodils and hyacinths are pushing out of the ground atop Lucky’s grave. Lunesta is sleeping in a basket by my side, soaking up the sunshine. I did the cover illustrations for both my books, by the way. The medium is pastel. How about you? Any pet stories you’d like to share? Have your pets played a role in your fiction? Tonight I attended the first in a series of group readings, part of “The Memoir Project” at The Arts Center of the Capital Region in Troy, NY. Memoirs are tremendously “in” right now, and this series features classes and workshops as well as readings. By and large, the evening was engrossing, but a large part of the appeal lay in seeing and hearing the writers live. I doubt I’d ever seek out their work in book form, and in fact I rarely read memoirs at all. The evening got me thinking – how much do we really care to know about the details of others’ lives? It’s a question pertinent to blogging as well. Why on earth should anyone want to read about the minutiae of someone else’s existence? To make it worth the reader’s time and effort, we need to strike a common chord that transcends self-centered blather. Therein lies the challenge of daily blogging. It’s even more challenging to blog at 11 p.m. when I’m sleepy and my two cats want their bedtime snack. Unfortunately my office also serves as their bedroom (and litter box room). Sometimes we share the space equitably, but when they’re restless or hungry they writhe around on my desk, claws extended, soliciting tummy rubs. Right now they’re telling me it’s time to sign off. I view blogging as a form of communal memoir grounded in the here and now. Any thoughts on this?